If you are used to the “normal” pattern of eating, intermittent fasting can seem intimidating at first. Many people just can’t get started or give up soon after starting intermittent fasting. So I thought I would give you my easy, non-intimidating way to start intermittent fasting (IF). So I came up with a way to start intermittent fasting by easing into the pattern of eating over the course of a week. You could also spread this out over a longer length of time to make it even easier. If you’re reading this, then you are most likely familiar with what intermittent fasting is, but let me quickly define it. Intermittent fasting is a pattern of eating. It’s not a diet that tells you what foods to eat. It is simply limiting the times you eat to a certain window. My chosen method of intermittent fasting is similar to lean gains. I just keep cutting my window shorter until I am losing 2-3 lbs a week. Then when I have lost the weight amount that I want, I begin to increase my eating window. So intermittent fasting is my “pattern of eating” and my particular “way of eating” is plant based. But you can choose whatever way of eating works best for you. Many enjoy combining paleo or IIFYM with IF. My suggestion would be to focus mostly on your pattern of eating while you are getting started. Start to make healthy exchanges maybe. Like a Lara bar instead of a donut or frozen fruit instead of ice cream. If you are the kind of person that likes a big challenge, then you could go all in by changing your way of eating and pattern of eating all at the same time. Or you could focus on way/diet first and then start to focus on your eating window. First determine your current eating window. For example I usually have my first meal/snack by 8AM. My last meal/snack is usually before 11PM. Now, decide your goal window and when you would like to reach this. My goal is a 6 hour eating window between 3PM and 9PM within 2 weeks. The increments get shorter the later I move my starting time because it gets more difficult as it gets later. You’ll find that you feel like you are gaining little victories each day by meeting your time goals. This drives you to feel that you can accomplish the next day’s goals. This method alleviates much of the discomfort that jump starting intermittent fasting can cause. It also alleviates the discouragement that you may feel by not being able to hold out until the start of your eating window (or giving in to late night cravings). It’s totally do-able and easy. Another easy way to start intermittent fasting is the spontaneous transition method. This way is the same principle just a little different approach. Basically, you hold out as long as possible and record the time. Each day you attempt to “beat” the time of the day before. For example, let’s say I waited Monday until 8:51AM to begin eating. And I stopped eating at 10:45PM. The next day, I would attempt to hold out longer than 8:51AM to begin eating and stop sooner than 10:45PM. So, if I began eating at 9:02AM & stopped at 10:40PM–SUCCESS! This method is more flexible and organic. You can spread out your transition over a much longer period of time. Your transition would be very easy while giving you the daily boost of confidence to keep you on track to meeting your IF goals ultimately. Sometimes I blend these two methods when starting IF. Basically, whatever gets you going and keeps you going until you are ultimately at your goal eating window that brings you the results & benefits that you are looking to get with intermittent fasting. After about 7-10 days at your goal eating window, it will begin to feel natural and very easy. That is what I have heard from most people and found myself to be true. I find this effortless feeling comes almost from day 1 or 2 when using these IF starting methods. What About Working Out While Starting IF? Since I am postpartum each time I have started IF, I do not work out (except for going for walks maybe) while getting started. By the time I begin a challenging workout program, I have usually been very well acclimated to intermittent fasting. I feel this would be a good choice for anyone, but if you decide to work out definitely take it a little easier on yourself while you are making this eating pattern adjustment. I must say: on the days that are more of a struggle, a slow walk is a great detractor from temptation and/or hunger. If a hard workout helps you in this same way, go for it! Just know that an hour or two after your workout, it will be VERY difficult to abstain if you are not more experienced with IF. I do recommend reading my 10 Steps to Getting Started Intermittent Fasting post for tips and information on getting started. And even though I do not think you should change your diet while getting started, I recommend applying the order of eating when you break the fast that is described in that post. Hopefully these intermittent fasting starting methods will make the transition to IF a breeze so that you can accomplish all of the wonderful benefits that fasting provides! I am starting my journey to IF for the third time and employing these starting methods in the past has been what has helped me to reach weight loss goals and feel mentally and physically strong. 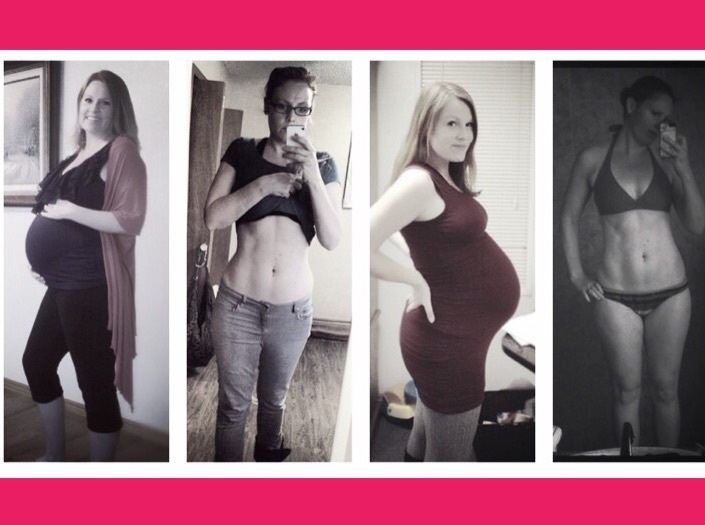 Here’s my postpartum/ “before” picture along with the reason that makes it all worth it. I’ve never heard of this plan before. Congratulations you look great. I’m trying to get back into eating right after the holidays and I’m back at the gym. No! In fact coffee is what gets me through the mornings. I drink bulletproof coffee every morning. Is it okay to add sweetener to my morning coffee? I can probably go without cream, but like a little sweetness. I already add coconut oil. Wow this seems like it’s really worked for you. I bet coupled with proper diet and exercise this is a good way to lose weight. I hadn’t heard of intermittent fasting before! This is very intriguing – I’ve done scheduled eating/fasting before, years ago. It seems similar, just not quite as focused. Thank you for sharing your tips! I am looking into this. I thinkthis would really help me kickstart. Thanks for breaking it all down!!! I’ve never heard of this but it sounds so interesting. 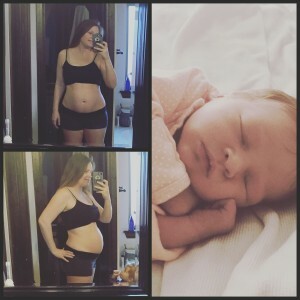 I had a baby 7 months ago and have had a stubborn 9 pounds to lose. I cut out processed sugar a little over a month ago and finally saw the scale budge a little bit last week. Question: you did this while nursing? I’m always concerned about how diet changes will affect my supply. I am very intrigued and will be reading your other info. Thank you! Yes I do start intermittent fasting while nursing. You are actually not cutting back on calories very much and you can still take in all the nutrients you need. I have never seen supply affected. I have several posts on my experience with bf & if and also some research on this topic. I love that sweet baby photo! Congrats on the baby and on being healthy. Your hard work is paying off! So its not about calories per day but more the window of time you’re eating? Or do you need to keep an eye on the number of calories consumed per day too?